Four OH are known to have served in the most significant naval conflict of WW1. Three commanded ships; two were mentioned in despatches and one recommended for promotion following the battle. Whether they were aware of each other as OH we do not know, although before the War W.L. Allen had succeeded F.P. Loder-Symonds as commander of HMS Achates. In brief, Commander W. L. Allen was commanding the flotilla leader HMS Broke a destroyer which was part of the 4th destroyer flotilla stationed behind the Grand Fleet. HMS Broke came under enemy fire on two occasions during the evening when "the ship was very badly damaged and casualties were enormous, but morale seems to have been unshaken and the ship successfully steamed back to port" 50 men were killed and 30 injured. Allen was mentioned in dispatches and recommended for a promotion. He was awarded the Order of St Stanilas (2nd class with swords). Revd Padre F E Sutcliffe was serving on board HMS Vincent. He married Gertrude Wilmot and his brothers in law, who were OHs, were serving in France, including Tom Wilmot whose letters home we are publishing on the website. C E Le Mesurier. At the Battle of Jutland, he commanded the Fourth Light Cruiser Squadron from light cruiser Calliope. She was badly damaged by a fuel oil fire in her boiler room while at sea on 19 March 1916, but was repaired in time to be one of the five ships in the 4th Light Cruiser Squadron at the Battle of Jutland on 31 May-1 June 1916. She received a number of hits just before nightfall on 31 May (notably by the German battleships Kaiser and Markgraf) and 10 of her crew were killed. 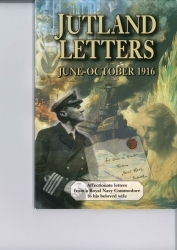 A collection of his letters home have been compiled into a book and we re-publish them with the kind permission of the publishers. Over the next 3 months we will be publishing the letters of one OH to his wife during this period.